Almost nine years ago when we began the work of spreading the three angels’ messages in Kenya, the work seemed to progress very slowly. At first we focused on supplying Bibles and Spirit of Prophecy books. As the work has grown, our focus remains the same, but the Lord has blessed and opened doors, and we have been able to build churches and worship shelters, three schools and an orphanage. The Lord has also impressed us to expand the medical missionary work. One clinic is operating, and we have plans for two more clinics. Not only does the clinic assist the people physically, but also spiritually. “Medical missionary work is the right hand of the gospel. It is necessary to the advancement of the cause of God. As through it men and women are led to see the importance of right habits of living, the saving power of the truth will be made known. Every city is to be entered by workers trained to do medical missionary work. As the right hand of the third angel’s message, God’s methods of treating disease will open doors for the entrance of present truth.” Testimonies, vol. 7, 59. 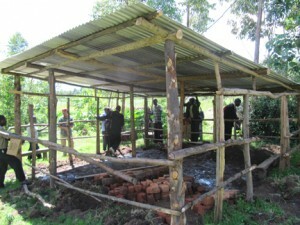 Rosiago worship shelter under construction. This past year eight new groups have been formed through the work of the Bible Workers and the power of the Holy Spirit. Since there are not enough funds to build churches for these groups, we have built five worship shelters. As the funds become available to build a more permanent church structure, the worship shelter will be used for a children’s Sabbath school room. A Sunday-keeping group at Rehema began to study with our Bible workers last year. The pastor, two elders and about 15 members were baptized and are now members of the Seventh-day Adventist church. Several other members from that group are studying, and we praise the Lord for them. About six months ago a Pentecostal pastor became deeply interested in the seventh-day Sabbath. After studying with our Bible workers, he, too, was baptized. He was the pastor of two Pentecostal churches. One of the churches studied with their newly converted pastor and our Bible worker. As a result, the owner of the land where their church building is located accepted the message, and he and about ten of the members were baptized. When we were in Kenya in March, we visited this group. The owner stated that he would give the land and the church to Advent Hope Ministries to advance the work in that area. “The LORD thy God in the midst of thee is mighty; he will save, he will rejoice over thee with joy; he will rest in his love, he will joy over thee with singing.” Zephaniah 3:17. “He [Jesus] approaches the Father, with whom there is joy over one sinner that repents; who rejoices over one with singing. Before the foundations of the earth were laid, the Father and the Son had united in a covenant to redeem man if he should be overcome by Satan.” Desire of Ages, 834. The people have the biggest smiles on their faces when they are told that God rejoices over them when they give their hearts to Him. Children from Advent Hope orphanage, singing for a meeting. The Bible, The Great Controversy, The Desire of Ages, Steps to Christ and Christ’s Object Lessons in Swahili are distributed free of charge to anyone who is studying and desires to learn more. Our four schools (one is still only a structure of leaves and sticks), orphanage and clinic also create interest with many of the people that our seven Bible workers are in contact with. 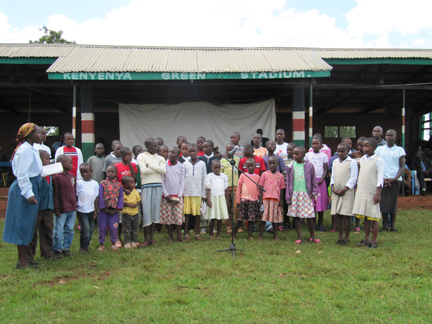 The children from the orphanage like to go to different areas to sing. This generates questions—why do they only sing religious songs? Why do they worship on Saturday? These and other questions are the ideal openings for a Bible study. Recently a group from an evangelical church, which also has a school with 176 children, has been studying with the principal of our Ibencho school. Out of the 40 church members, only three had a Bible, and they were old and torn. Their pastor and two elders sought further details regarding the Sabbath, and they had questions regarding the cross and the plan of salvation. What an opportunity to share the three angels’ message and the gospel! “Christ came to our world to represent the character of God as it is represented in His holy law; for His law is a transcript of His character. Christ was both the law and the gospel. The angel that proclaims the everlasting gospel proclaims the law of God; for the gospel of salvation brings men to obedience of the law, whereby their characters are formed after the divine similitude.” Selected Message, vol. 2, 106. The government digging a well 30 feet from the orphanage property. The orphanage that Advent Hope built was made to house 108 orphans. We only have 50 children at present, not because there is any lack of orphans, but to give the workers a chance to adjust to caring for the children. Also, our current water supply is from tanks that catch rain water from the roofs of the buildings. If it does not rain for five days, the tanks run dry, and the children have to carry water from the spring which is about a mile away. 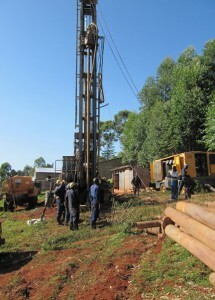 In March, the plan was to install a “RAM” pump to pump the water from the spring to the orphanage. Every effort was made to complete this project, but it just did not work. The distance was too great, and the elevation change of 350 feet was just too much. The day after the decision was made that it would not work and that time was being wasted, a truck with equipment to dig a well came to Ibencho. When questions were asked, it was found that a well was going to be dug for the community. Bill talked to the men who were digging the well. They began to search for the best source of water, and they decided to dig about 30 feet from the orphanage property! This truly was divine intervention. Ibencho is a remote area. Well digging equipment is very difficult to find and very expensive to hire. We knew that we would not be able to afford this. 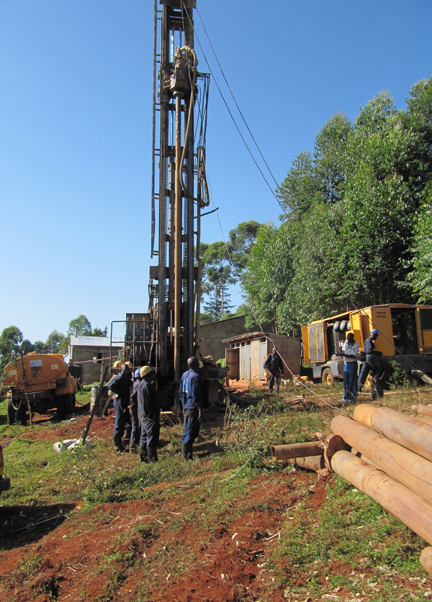 But the government provided the equipment and dug the well which hit water at 286 feet. The latrines for the boys had to be relocated, but the government has promised to install the pump in June and then pump directly to the tanks at the orphanage. This is truly an answer to prayer. When this is completed, we will be able to allow more children to come to the orphanage. We have a waiting list of almost 200 children. Please pray for guidance for the workers in training these children to serve the Lord. As we see the events in the world and are impressed with the seriousness of the times in which we live, may God bless and guide each one of us as we each do our part to spread the truth to others. “Make haste to obtain a fitness for the mansions which Christ has gone to prepare for all that love him. The day is far spent, the night is at hand. Make haste to ripen for Heaven.” Review and Herald, May 30, 1882.